Introduction of cloud technology has revolutionized the IT industry. Naturally, there is no doubt that the health industry will also be equally benefited from this new technology immensely. 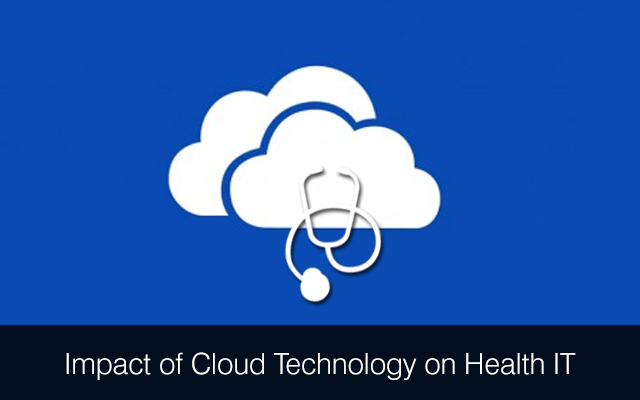 In fact, such has been the impact of cloud technology on health related IT industry that the sector has seen a growth of a new proportion altogether. Amongst all the industry sectors that have received shot in the arms because of the advent of cloud technology, health care sector has been the one that has seen the maximum impact. Let us discuss some of the benefits that this particular sector now enjoys because of the cloud technology. This particular technology has offered optimal durability when it comes to securing as well as safeguarding the database of the clients along with other critical information. The technology offers an option to the service providers to build a large amount of data centres. These data centres help users to maintain backup along with the resiliency of data and lower the cost uptime. The technology is extremely cost effective and thus can be adapted by even the smaller clinics which relatively weaker coffers. As patients’ databases contain a lot of confidential data there is an utmost need of protecting them 24×7. This is why, the IT infrastructure as well as the network system of hospitals or clinics need to be absolutely secured from the hackers or unauthorized as well as illegal users. Cloud computing has provided that level of security to make sure that the data stored are absolutely safe as well as secured. However, health care clinics as well as hospitals who take the help of cloud computing mechanism adhere to the Health Insurance Portability & Accountability Act or HIPAA. In general, any business opting to create any additional storage system for maintaining a backup other than their regular storage space, have to incur some extra cost to have access to the resource. Cloud computing does the same thing, but with the involvement of a much lesser cost. This is because the new mechanism only responses to the basic needs of its clients rather than any other factors. Naturally, this will lead to a considerable amount of cost cutting which after all, every business looks forward to. Only a permission granted by a doctor will allow an individual to have access to the database of any hospital or a health clinic. However, even if an individual has the doctor’s permission, visibility may be at times, restricted and the login details may not be always available under normal circumstances. However, with the advent of cloud technology, patients and their relatives are able to log in to the database and avail any information they might need, for referring to prescriptions that match with the ailments. Again, this will give someone the chance to consult a doctor even if the doctor is out of the station and this naturally gives a shot in the arm of the health care sector in a huge way. Patients, who are critically ill, are saved because of this technology as for them, time is extremely crucial and any delay whatsoever can lead to fatality that may even cause death. The conventional intranet systems that were previously used in health as well as other industry sector were mainly dependent on the desktop computers used by individual employees. However, the advent of cloud computing has introduced a great deal of mobility to the users along with an appreciable extent of convenience. Thanks to this technology, healthcare professionals as well as others who are authorized are able to get access to important information on any mobile device like Smartphones, tabs and so on, even without any permission or special settings. The world of technology is changing at a lightning speed. Cloud computing is simply one of the most robust and revolutionary technologies that have been introduced recently. Much due to this particular technique, it is now possible to access files and applications that are shared online. Thanks to the technology, doctors and medical professionals are now able to share the same information from different locations. You can get in touch with healthcare mobile app development companies to get your software developed. We provide EMR EHR software development services. If you would like to talk to one of our certified EMR software developers, please get in touch with us at Mindfire Solutions. This Post was posted in Health Care and tagged develop ambulatory ehr ssolutions, develop ambulatory healthcare system, develop clinical information management systems, develop physician cpoe systems, EMR EHR Software development, emr software developers, healthcare mobile app development, iphone medical app developers, mobile health app development, web based EMR/EHR development. Bookmark the permalink.